Handbook of Checked Baggage Screening – Advanced Airport Security Operation is a practical guide for project managers and designers embarking on hold-baggage screening developments within the airport environment for the first time. The book clearly explains away any uncertainty about the processes and procedures to be used by the various parties involved within the industry and sets out ‘best practice’ with respect to checked baggage screening design. Valuable lessons can be learned from actual case studies contributed by leading equipment manufacturers on recent 100% hold baggage screening projects. 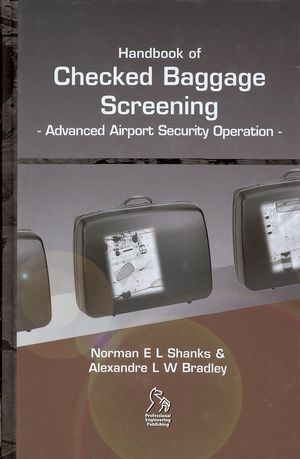 In addition to the all-important security screening of baggage and passengers the book also looks at the following areas associated with airport security, through the use of a detailed structured security check-list evaluation questionnaire. The questionnaire allows airports to assess the state of readiness of their airports and then, using the other chapters, gain an insight regarding which technology will best solve any security gaps. The authors offer a unique perspective through their background and experience. Many of the checked baggage screening procedures and equipment discussed in the book have already been implemented in the UK, with the authors responsible for leading this effort. The combined experience they can offer to the industry world wide is invaluable. Norman Shanks is an established professional in the aviation industry; he is recognized as one of the world’s foremost experts in aviation security, with over 30 years’ operational and management experience in international civil aviation. Alexandre Bradley is a Chartered Mechanical Engineer with over 15 years of baggage handling systems design and airport master planning experience. He was employed by BAA plc (Formerly British Airport Authority) for 10 years as Specialist Systems BHS and HBS Design Engineer and then as an Airport Business Analyst. As a Master Planner (Baggage Systems), he has been responsible for the design, evaluation and remediation recommendations on many baggage handling systems and HBS installations across Asia, Europe and Canada. Chapter 1. Where to Start. Chapter 2. Hold Baggage Screening. Chapter 4. Dealing with Governments. Chapter 5. The Client and Users. Chapter 7. General Airport Processes. Chapter 8. General Airport Development Models. Chapter 12. The HBS Project Programme. Chapter 13. Airport Systems Maintenance.